We have a pretty cool room for baby. Back when we bought the house, this large bedroom was painted with very random royal blue paint, but had a twee window that was so cute and a nice built-in shelving unit. It only took us a month of living there to get that mess primed over, and the gross carpet ripped out. 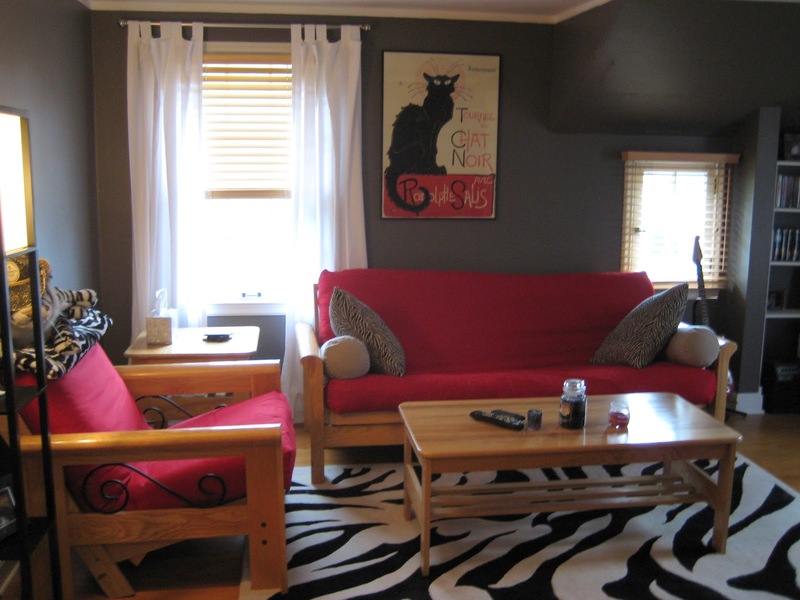 Shortly after, I let Shaun pick the paint color (Behr Simple Silhouette), and it became sort of a 'man room' with my old tube tv while we saved up for a flat screen for the living room. My old futon set is not anything I would buy today, but it was very 'IN' when I bought it in 2000. Luckily, I unloaded it on CL for almost $500! I love Craigslist. In 2009, we moved our old bed in here when we got our TempurPedic, and it's been basically a random stuff/guest room since then. Here it is today, with our living and dining room rugs on the bed. See, random stuff. Check the difference the wide angle lens makes! Love it. We are not changing the wall color when it becomes baby's room, it's so bright in here I think the dark color works well. The closet has some very awkward organization added by the previous owners, not sure if that is going to be redone or not. It's almost impossible to get to the back right portion. And ooops, I forgot about some blue inside that door! My thrift store campaign style dresser will be the changing table, when I get around to picking a paint color. 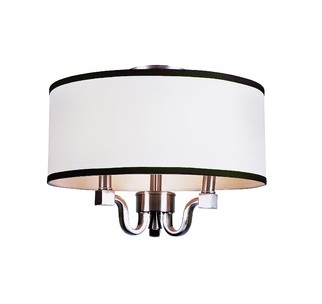 I love the ceiling light and matching sconce above the dresser. They are stylish but still nursery-appropriate. I just made that criteria up. I got them from LunaWarehouse for a great price, they always offer extra coupons. Sconce here, ceiling fixture here. I'm looking forward to baby H having a nice big play area when we get that queen bed and huge tv out of here! I've picked up a bigger rug, the zebra is a too-small 5x7. 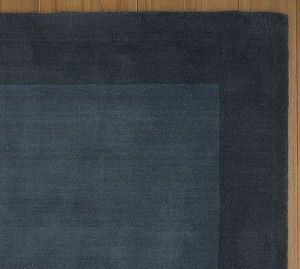 I found a brand new 8x10 of this Pottery Barn Henley rug (in Sailor Blue) on eBay for $300. Holla! Now I just need to figure out what else I'm doing in this room. That is the hard part. Hard, but fun! That room is hugggge. In love with the sconce. That is one massive nursery. I love it! I also love that the crib etc can go in one area and the other will be great for playing/lounging/reading etc and will definitely grow with your little guy!! Dang, that's going to be an awesome nursery! I can't get over how big it is!! Ha, I thought ours was big until I started putting stuff in it - silly girl. :) And I concur, peacock blue on the dresser! That's a great room - lots of space for furniture and playing! Can't wait to see what you do with it :) And now I'm off to check out Luna Warehouse since I need a light for my sitting room. I love grey for a baby room! You have some really large rooms in your home! I feel like we're squished like sardines in our master bedroom... let alone a potential baby room! Very nice! that's a great space, looking forward to the transformation into a nursery! loving the new rug and light fixtures! This is an awesome room - what a perfect nursery it will be! And so big and bright! YOu have a nice big room to work with, unlike us. And hooray that it is already painted (minus 1 door). EW. that Blue in on the backside of the door almost made me barf. Especially since my eyes were so used to that lovely shade of gray. What was Boozy thinking with that paint job? That room is def. going to be a rad playroom! I like it a lot as the man-cave, too. I guess all good things must come to an end. The room has so much potential and the floors and wall color are great. I can't wait to see what you put together! That room layout is so cool - reminds me of the room I had as a kid! My sympathies on the bright blue doors...I've spent the past 4 days painting over the SCREAMING red the genius prior owners slathered all over my bathroom doors. What were these people thinking? I can't wait to see what you do with the rest of the room! Nursery designs are my very favorite, I think. That is an awesome room for a baby. And I love that you're keeping the wall color. Aaaaand I love your granite. What a great room! and I'd kill for that campaign dresser!!! I've been stalking CL for-evah for one. and your kitchen is looking so amazing!!!! I love all your choices. Love the colors in here! That grey is awesome and the henley blue rug was such a steal. Can't wait to see it come together!